One of my favorite memories of last year's Christmas season is of my son crawling into bed with me on cold December mornings and asking, “Mom can we listen to the Martin & Sylvia Audio Advent Calendar for today?” The short, sweet stories were so perfect for an extra ten minutes of snuggling. How could I say no? 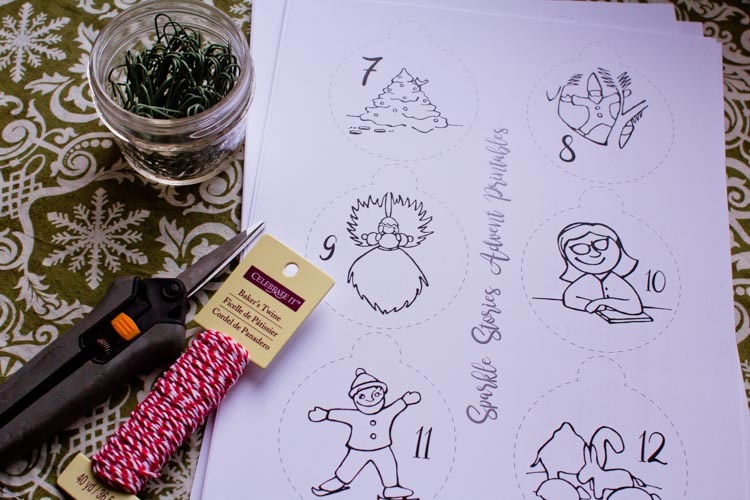 For this year's calendar, our lovely Sparkle Stories artists have made a beautiful set of printable ornaments to go along with the Sparkle Audio Advent Calendar (learn more about it with the Advent Cheat Sheet). 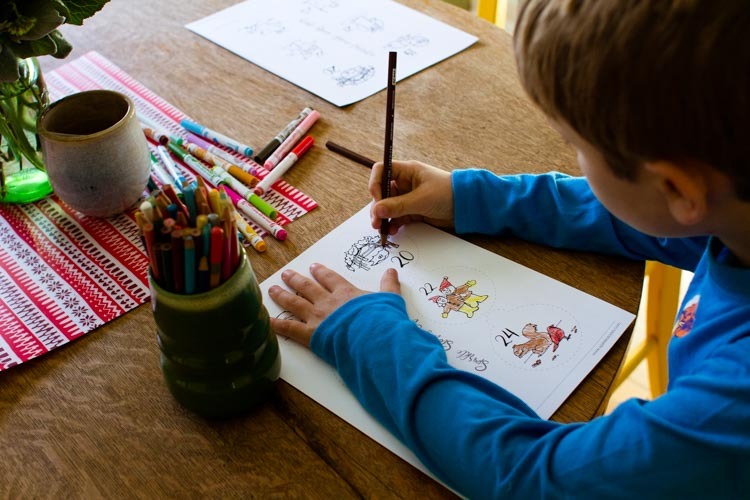 Whether you listen snuggled in bed or around the table or in the car, your kiddos can color one every day to help count the days to Christmas. But once you have them colored in, you'll definitely want to display them. Here are three easy ideas for doing just that. 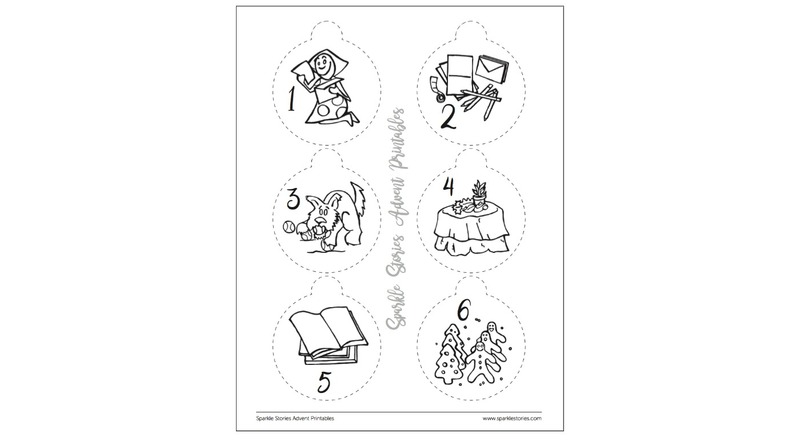 For all three you'll need to print the Sparkle Advent Calendar ornaments. (They'll hold up best if you print them on card stock.) 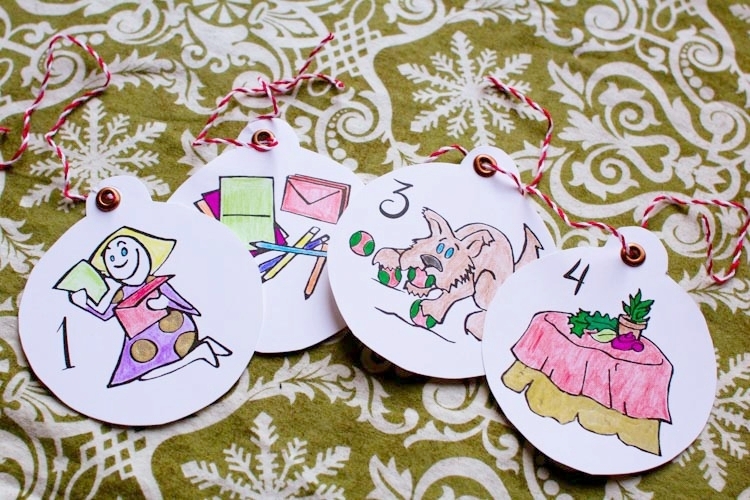 You'll also need some baker's twine or ornament hooks, and a hole punch to make a tidy hole in the top of each ornament. Choose the display that you like best, and let's get started. 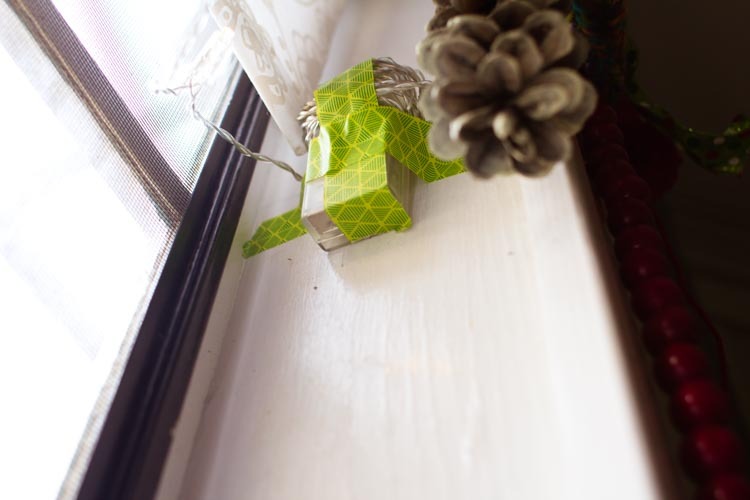 I am a huge fan of using real greenery for Christmas, but I recommmend artificial greenery for this particular project since it would be very difficult to keep the fresh greenery moist all month without also fatally wetting the paper ornaments. To start, lay the hoop out on a table in front of you like you're looking at a clock. 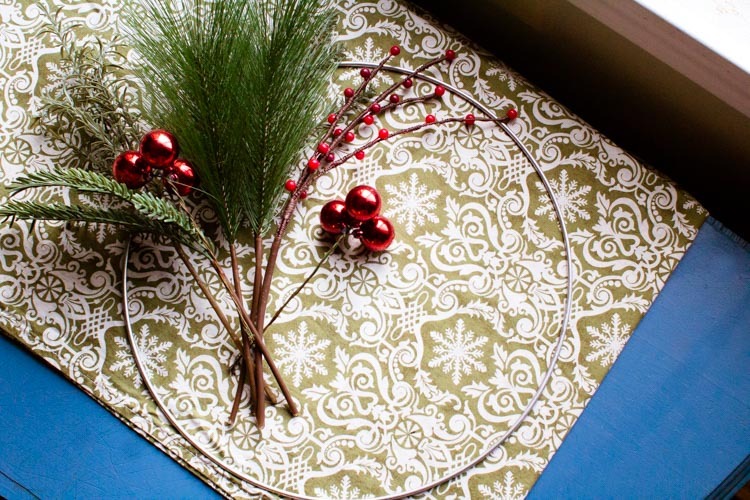 Arrange the greenery, berries, and ornaments so that they will drape from 12 to 9, then use the floral wire to secure the stems to the wire hoop. 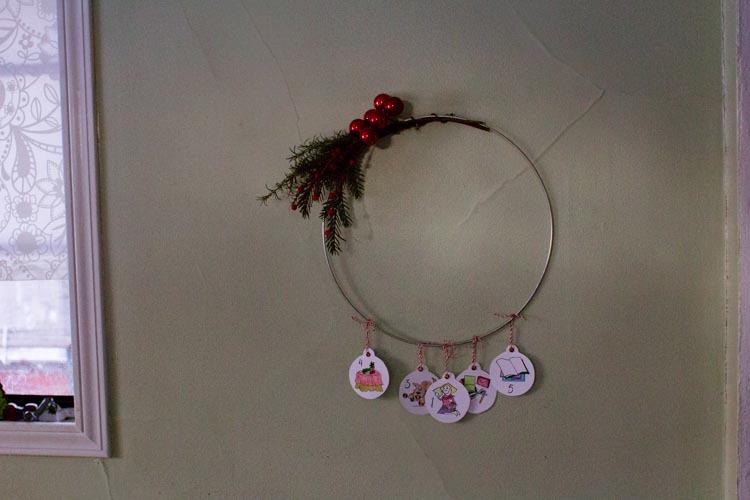 Hang the hoop with a nail or wreath hanger. When you're ready to add the ornaments, tie a short length of baker's twine through the hole in the top of each ornament, then tie the ornaments around the bottom edge of the hoop. 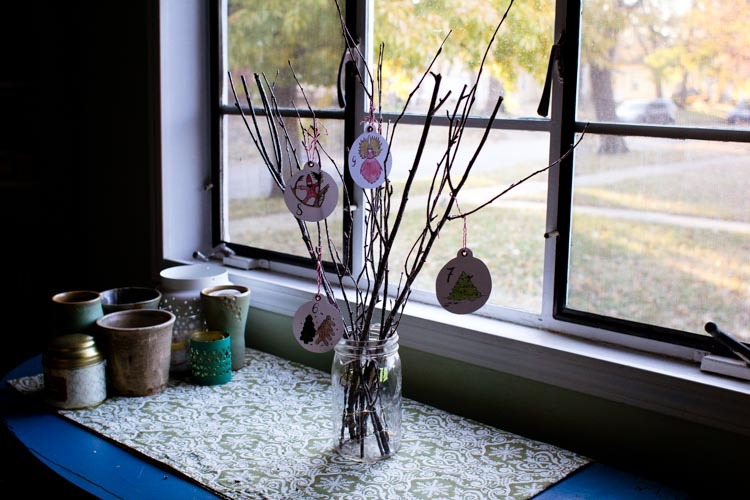 I love going on winter walks with my kids to collect sticks for this kind of project, but if that's not do-able for you because of where you live, remember, you can get sticks — often some really glittery and fun sticks — at the craft store, too! Once you have your sticks, find a jar or vase that is proportionate, then put the twinkle lights inside. 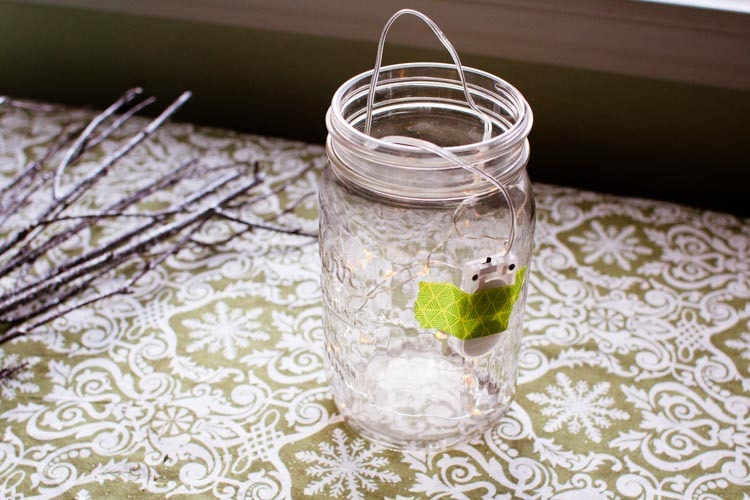 Tape the light switch to the outside of the back of the jar, then arrange the sticks amidst the lights. 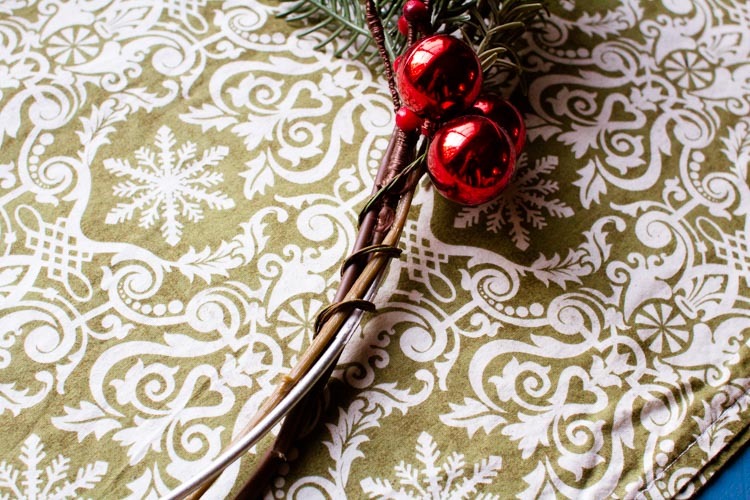 To display the ornaments, use hooks or baker's twine to hang them from the branches. 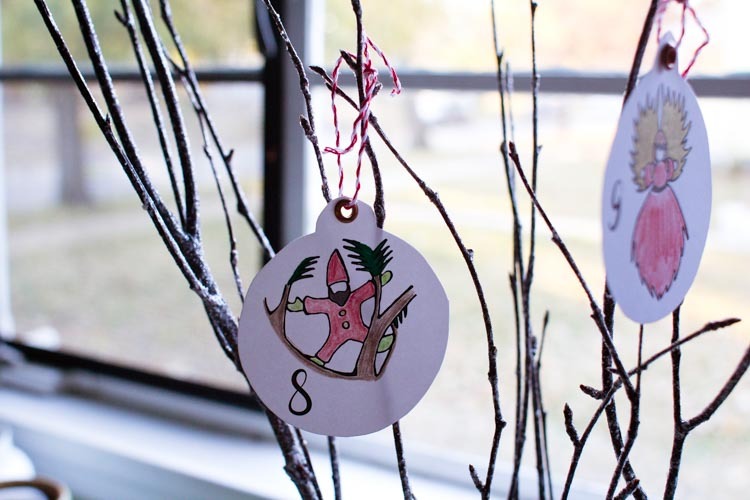 While I love elegant, matching holiday displays, with young kids in the house, our style of decorating tends towards Popsicle stick ornaments and finger-painted Rudolphs. And you know what? I actually love that, too. 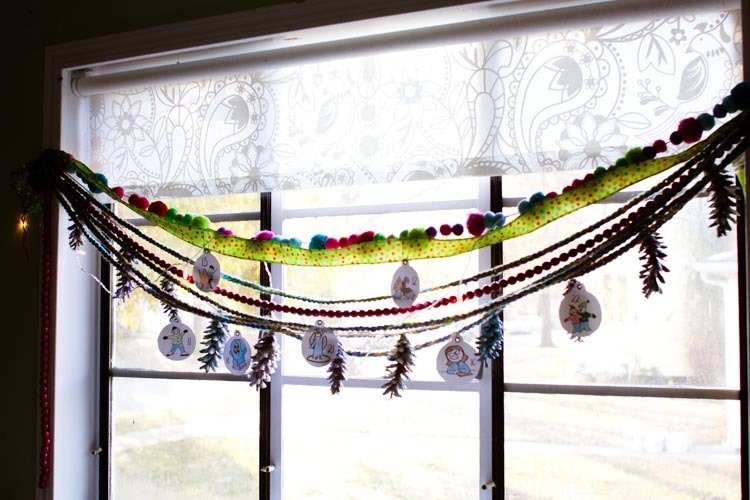 If you're in the same boat, I say own it with this madcap garland. The trick is to not get too fussy. I bought exactly one garland for this project. The rest were all tucked in our basement. They aren't the same style. They don't match. 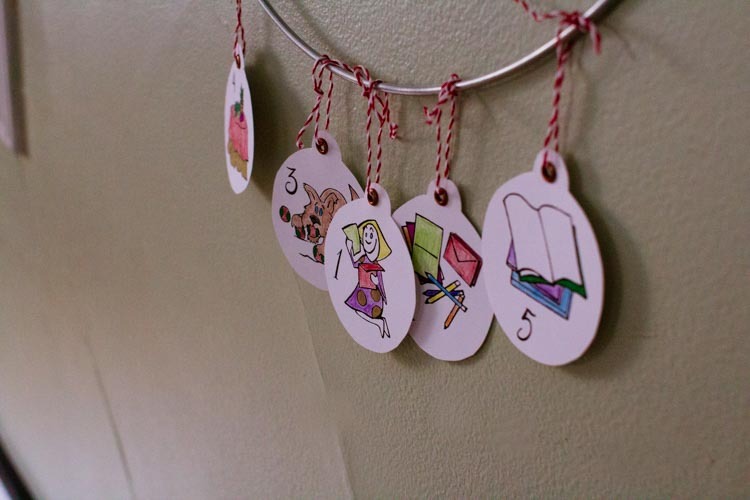 But when you hang them all together, it's kind of whimsical, right? 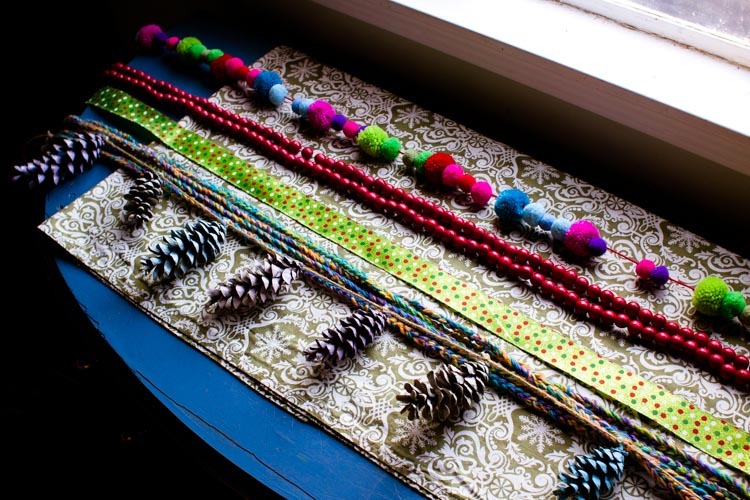 The only “rule” is that the garlands need to be about the same length. 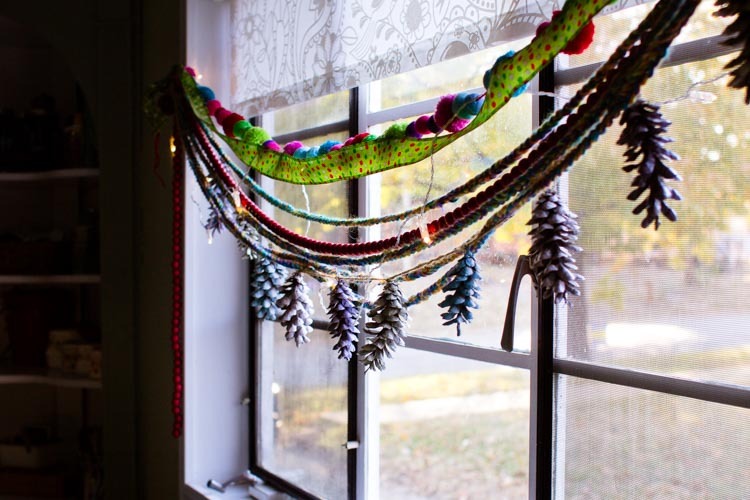 The desired length will depend on where you want the garlands to hang, but you should generally figure that you need something the same length of your space plus about 2 feet to give the garland some room to drape. 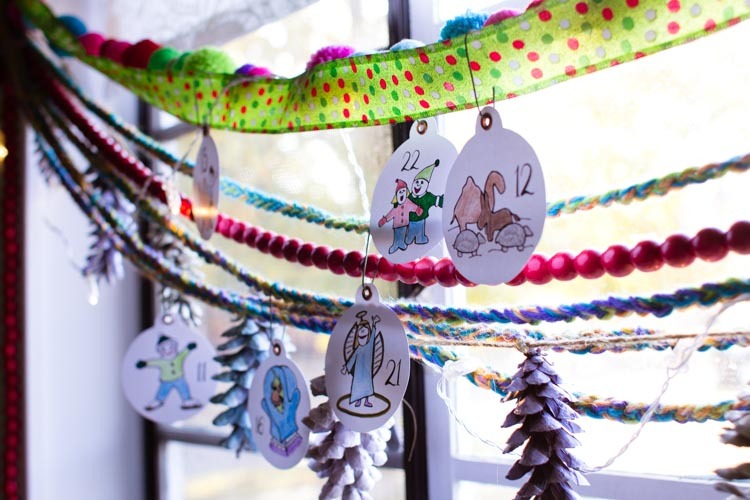 Last, but not least, add your Sparkle Advent Calendar ornaments each day, using either hooks or baker's twine.